TOSOT may be a name you’re unfamiliar with as their line of dehumidifiers have only recently been introduced to the US market, but we can strongly confirm that they have quickly become very popular amongst consumers. So much so in fact that their dehumidifiers are outselling many of their well-known competitors. Like most dehumidifier manufacturers, TOSOT produce several models which are categorized by their dehumidification capacity. In this line-up, you’ll find a 30 pint, 50 pint and two 70 pint models, one of which is designed with a built-in pump. 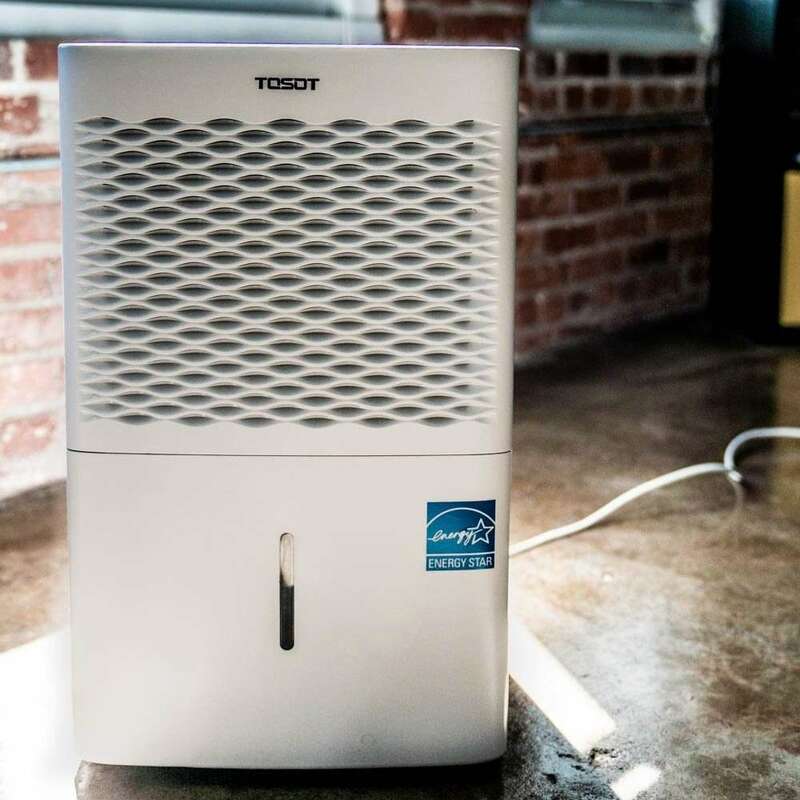 In this review, we’ll cover the features of TOSOT’s 70 pint dehumidifier to help you decide whether this is the right model for your needs. The rest of our dehumidifier reviews can be found here. As the size rating suggests, this dehumidifier is capable of removing 70 pints of water from the air in a 24 hour period. This makes this model suitable for a wide variety of rooms and internal spaces, whether big or small. Dehumidifier manufacturers are placing a greater level of importance on the noise produced whilst their devices are running instead of only concentrating on outright dehumidifying performance. TOSOT are an industry leader in this regard as their range of dehumidifiers are some of the quietest we have ever tested. Due to refining the technology their models use, they have managed to produce a 70 pint dehumidifier that outputs a maximum of 52 decibels of sound during routine operation. Perfect for use in a living room, bedroom or study. No respectable dehumidifier is complete without an integrated humidistat. The electronic LED display on this model allows you to not only set the level of dehumidification (between 35-80%) that you require but also view the current level of internal humidity. 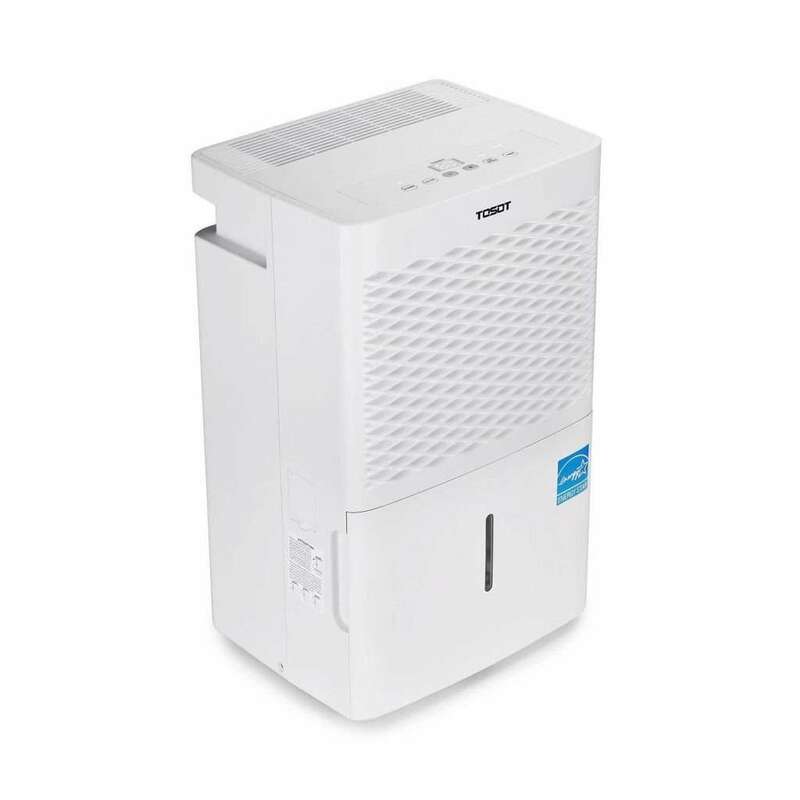 Mold and mildew becomes more prevalent above 60% relative humidity which makes this model perfect for keeping mold spores and other types of unwanted allergens at bay. The operating temperature range for this model is rated at between 41 and 90 degrees Fahrenheit which is standard for a consumer grade dehumidifier. The built-in drain bucket has a water capacity of 16 pints which equates to 2 gallons of water. In practice, this means that you will be required to empty the tank up to every 5 hours depending on the humidity level of the environment you are dehumidifying. During testing, we didn’t encounter the need to empty the drain bucket any more frequently than once every day whilst in use in a medium sized open lounge with a medium level (55%) of humidity. The drainage bucket itself is very well designed which reduces the probability of spills, even when full. Two 70 pint dehumidifiers are available within this range, one with an internal pump and one without. We’re reviewing the pump model which allows you to activate a continuous drainage mode which will pump collected water out of the device to your drain of choice. Models without the internal pump rely on gravity drainage (through a hose) which could make disposing of water more difficult depending on where you choose to locate your dehumidifier. The entire range of dehumidifiers are fitted with air filters which act to trap any airborne particles that are present within the atmosphere. This filter can be removed for cleaning which should be performed every 250 hours of operation. Usefully, the TOSOT range are fitted with an indicator light which will illuminate when the filter requires cleaning, cleaning which requires nothing more than warm water and mild detergent. Many homeowners place their dehumidifiers in locations which are unattended such as their basement or attic. Access to these locations isn’t always convenient which is why the built in auto-start function which will reset the device should a power outage occur is very useful. Every model within this range is supplied with a drain hose which can be attached to the rear of the dehumidifier to assist with disposal of any collected water – a must have feature for use in very humid or unattended environments. Efficiency is importance for any electrical device and dehumidifiers are no different. This model has an EER rating of 2.0 which is the best you’ll get for a model of this size. In practice, this model has a maximum power requirement of 710 watts which is rarely reached in normal operation. You will find that around 450 watts of power consumption is an accurate figure during normal operation. As you can see, the feature set of this model is up there with its best competitors but how does this model perform in real world use? We’ve included a list of pros and cons to help you decide. Easy to setup - simply plug it in and switch it on. The instruction manual covers the basic operation of this model which should be consulted if you have any questions or wish to activate certain features. Very quiet. We said it earlier, but this truly is a fantastically quiet dehumidifier which outperforms other models in the noise output stakes. Works well in cold environments. The auto defrost function is very useful and will be a benefit to you if you choose to place this device within your basement. Very powerful. You will notice that the water reservoir fills up very quickly in humid environments which is proof that this model is working to dehumidify your home. We noticed that the drain plug is prone to breaking if not handled delicately. Not an issue if you’re using the included drain hose but be weary with fiddling with the plug if you only intend on using the internal water tank. Not the cheapest range of dehumidifiers available but generally comparable with the pricing of competitors of a similar quality. We can safely say that TOSOT have succeeded in making waves within the dehumidifier industry and have rapidly become a brand to take notice of. This model is efficient, powerful and reliable with the capability required to dehumidify your home for years to come. The negative points we encountered are not significant enough to dim our view of this model, allowing us to recommend it if you’re in the market for a 70 pint dehumidifier. Based upon the quality of the 70 pint model, we have no hesitation in recommending the other size categories if you have a smaller budget or wish to dehumidify a much smaller space.